Thanks so much for hosting this party, Melissa! Thanks so much Melissa for Hosting!!! So much fun! Thanks so much for stopping by and leaving a sweet comment on my Vintage Metal Cart Makeover and inviting me to your party. I'm following you on Facebook and Pinterest now. I hope you have a wonderful weekend! Thank you for hosting and for inviting me! 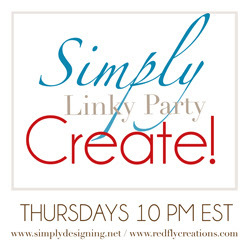 I've linked up two recipes and I've added your button to my party page!